It’s time to kick off the 2016 Block of the Month. Last year we traveled together on a 12-month quilt adventure, the 2015 Adventure Quilt Block of the Month. I hope you enjoyed learning unique quilt block ideas the third Saturday of each month. I, too, looked forward to those Saturdays and admit I was a bit sad to see it end. Good news! I decided to devote another block of the month lesson the third Saturday of the month for a new Block of the Month quilt-along for 2016. But wait, it is the second Saturday of January! Not too worry; today we will cover some quilting basics from my new book, Change-Up Patchwork and prep fabrics to use throughout the 2016 Block of the Month year. This year we will create all 12 blocks from strata strip-sets. 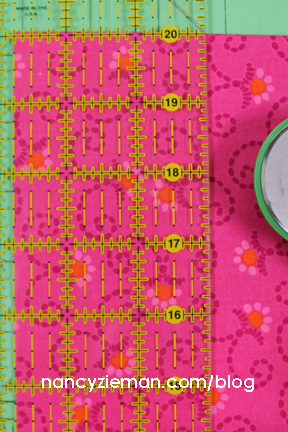 The tools needed for 2016 are brief and simple: Each block will use my Trace’n Create Carefree Curves Template Collection, interfacing, rotary cutting tools, and of course fabric! 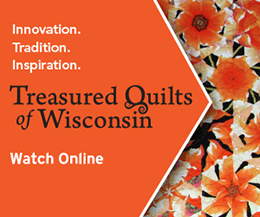 The 2016 Quilt Extravaganza will use stratas, or a set of fabric strips stitched together, each month. 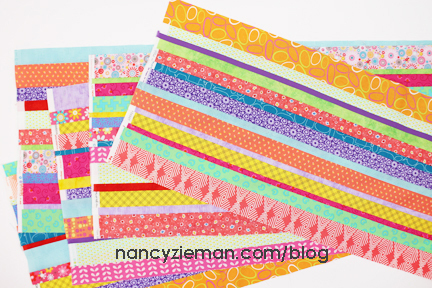 Stratas will allow you to create an amazing scrappy quilt while using your fabric stash. The finished quilt is value-based, meaning the light and dark value of each fabric is more important than the actual colors. Fabric should be chosen or sorted into two value piles. In this case, I chose brights and neutrals. To make a large wall quilt, choose or purchase enough fabric to create four strata of each value. For a bed-size quilt, make eight or more of each strata value. We used fewer fabrics for the neutral stratas—approximately half of each of the five tonal prints. 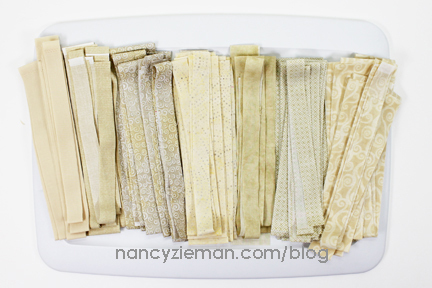 If you have less fabric variety, more yardage of each print is needed. Apply starch alternative, such as Quilter’s Starch Savvy or Mary Ellen’s Best Press, on the entire cut of fabric. Press with an iron. 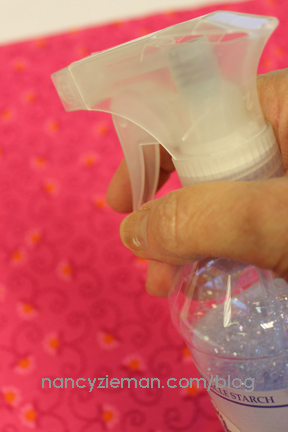 The spray, combined with pressing, adds crispness to the fabric, making it easier to cut. Fold the fabric in half meeting the selvages. Place fabric on a gridded rotary cutting mat. Align the fold of the fabric along one of the horizontal lines at the lower edge of the mat. Position a ruler on the fabric perpendicular to the fold so it forms a right angle. 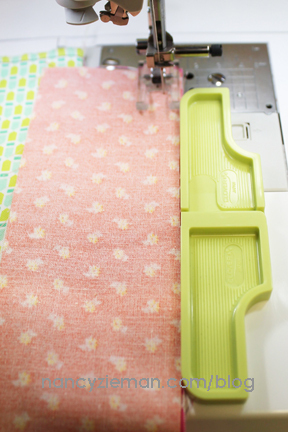 Straighten the fabric edges and use the rotary cutter to trim away any excess fabric. Note from Nancy: For greatest accuracy, I prefer to have the majority of the fabric to the left of the ruler when I make that first cut. Firmly hold the ruler in position with your left hand and cut with your right. Before cutting the strips, carefully rotate the mat so the trimmed edge of the fabric is on the left. 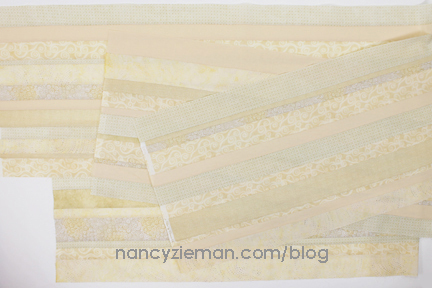 Cut fabric into crosswise strips. Align one of the ruler’s horizontal lines with the fabric fold. Working from the straightened edge, place the line that corresponds to the desired strip width along the straightened edge of the fabric and cut with the rotary cutter. Cut a variety of strips widths, ranging from 1-1/2″—3-1/2″. Cut strips in varying widths from each fabric. Group the cut strips by value: brights with brights and neutrals with neutrals. Arrange and mix the strips within each value. Set stitch length at 2.0, slightly shorter than normal. Strips will be recut, so a shorter stitch length makes stitching more secure. Join right sides together, edges even. Stitch using a ¼” seam. Note from Nancy: Stitch each strip from the opposite direction—this will aid in keeping strips aligned producing straighter strata. Try not to use the narrowest strips on the outer edges of the strata. 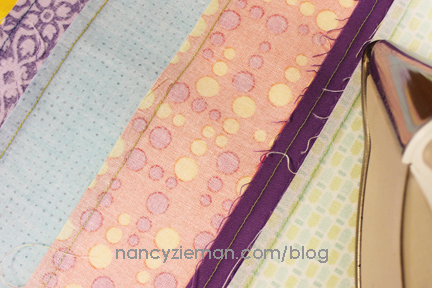 Note from Nancy: To help stitch accurate ¼” seams, I like to use the 6-in-1 Stitch and Stick Seam Guides. Note From Nancy: At this point you may be tempted to call this a string quilt. Unlike a string quilt, our strata are not constructed on a foundation paper or fabric. When choosing fabrics, keep this key note in mind: The strata should measure a minimum of 18″ tall x width of fabric when stitched and pressed. 1. Work on a stable pressing surface. Press seams flat, then toward the darker fabric. 2. Press seams on the right side of the fabric, making sure that there aren’t any tucks or wrinkles on the right side. 3. 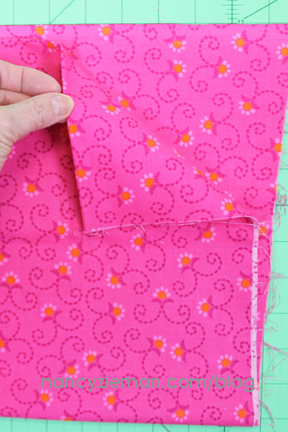 Use a Tailor’s Clapper to aid in pressing, and you’ll be amazed at how flat your quilt seams lay. The wood clapper absorbs the heat and steam from fabric, and holds the press as the fabric cools. If you’re like me, sometimes personal sewing projects get misplaced. Since this project will take us through the duration of the year, I wanted to share my tip for keeping this quilt organized. You won’t believe how easy it is—pizza boxes. Unused, of course! 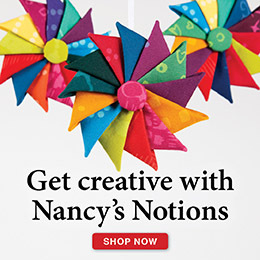 Next time you pick up a pizza to go, ask the pizzeria if they would sell you an unused extra-large pizza box, or store your blocks in a size medium box from Nancy’s Notions. 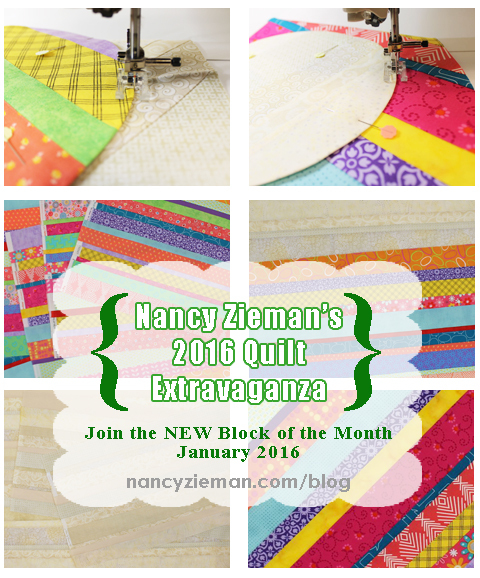 Store the eight total strip sets and join me here next week as we launch the 2016 Quilt Extravaganza Block of the Month. 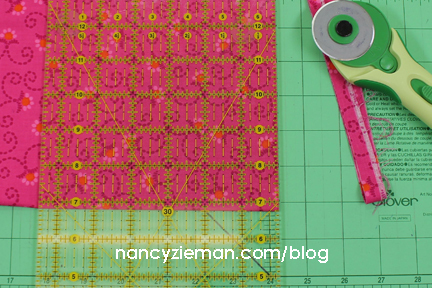 Get a jump on the construction details in the upcoming quilt-along with my two-part series featuring the Trace’n Create Carefree Curves tools on Sewing With Nancy. 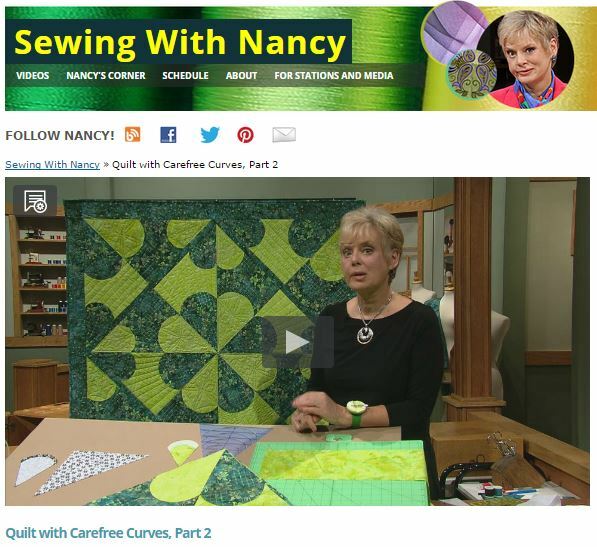 Watch Quilt with Carefree Curves (Part One and Part Two) on Sewing With Nancy online. 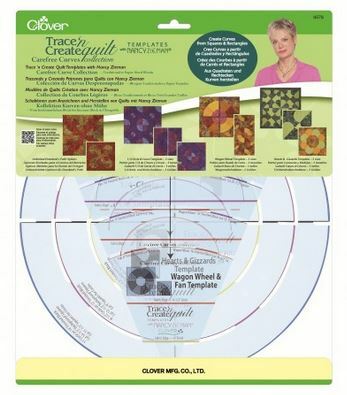 For an opportunity to have a Trace ‘n Create Carefree Curves Template Set from Clover, simply leave a comment answering this question: What is your favorite size quilt to make? Send in a photo of your strata strip sets and we’ll share with others in upcoming blogs and on Facebook. I’d really like to see what fabrics you’re using! Send the images to [email protected]. bigger quilts and I want them to be used on beds. I am fascinated by the circles with this Clover tool. Is it to late for the free tool or should I just order one? I am accumulating a lot of scrap fabrics because I tend to buy extra material for my projects since I have a tendency to make some booboos when cutting fabric. Also, if the fabric is on super sale and it would be suitable for backing, I might buy as much as 9 yds and then I use it for something else I could have yards left over. Though crib or lap quilts are so much easier to handle, I quilt with the recipient in mind. That usually means queen-sized for adults. I enjoy the process so much, I don’t think too much about size. I like lap-baby- wall size quilts as I can quilt by machine more easily. Queen sized quilts are my favorite because they can be used on most any bed. I love that I can give a loved one something that keeps them comfy and cozy and that they know I made it just for them. I like to make long table runners that will go across the bottom of a bed or across the back of a chair or couch. It dresses things up easily for holidays and keeps our cats from tearing up the top of the couch. When I first started quilting, I thought you had to make a bed size quilt. I have since started making smaller quilts, and have found that I really prefer to make them. They make up faster, so I don’t get bored with it, and if I hand quilt it, it doesn’t take as long. I like all size quilts but the lap size is a size that is easier to work with and good for gift giving or giving to auctions for charity. Also, how many large size quilts can you really have! Yikes! people know I sew and make quilts so I get a lot of what I call “orphan” fabrics. I usually need to purchase additional fabric to fill in so my quilt sizes depend on how far all this stretches. most of them fall in the lap to twin size range and this is where creative borders can come in to play. one of my orphan fabrics was the foundation for last years block of the month which ended up giving it a more modernistic look than I usually do. I don’t like to make anything above a queen size because it’s too hard to handle all the bulk for free motion and/or my frame is too small for any bigger. Most of my quilts are Quilts of Valor, so they are lap sized. My favorite size quilt to make is queen size because in general, it will fit most beds. My favourite quilt size is any size where the need is. I prefer QAG type quilts, because when I’m done, I’m done. Thank you for the opportunity to win a set of your Trace’n Create Carefree Curves. I look forward to your BoM for 2016. I appreciate your continuing to offer this fun quilt along. I like to make smaller pieces such as lap quilts, wall hangings or bed runners. I like to make lap and baby quilts best. They are short projects, and I usually have several others planned before I am done with the current project. Doing lap and baby quilts allows me to try new and different techniques on a variety of projects…..
My favorite quilt size is the one I need for most of the beds in my house – queen size! But I seem to mostly find myself making a throw size masterpiece for easy handling. My favorite quilt size is a lap quilt. It’s easier for me to handle when I get to the machine quilting stage. My favorite size is Queen size. This BOM looks like so much fun! Thank you for hosting & walking us through it! And thanks for the chance to win the Trace ‘n Create Carefree Curves Template Set from Clover! My fave size quilt to make is an oversized lap quilt. It’s the perfect size to cuddle under, make & give. well…actually, I also like to make baby size quilts too, for the same reasons. I like quilts to fit my full size bed. It really doesn’t take that much longer than a smaller one. I like to make baby quilts. They go together so fast. They are also easier to quilt on your home machine. I like to make baby quilts or lap quilts. They go together faster as well as easier to quilt on your home machine. Baby quilts for babies at church (baptism or new babies) given by the women’s ministry, plus twin size for teens in my family, and queen/king for adult family members and friends. Hand applique blocks are a favorite of mine followed by machine piecing for the smaller quilts. Many of my large quilts are quilted by professional long arm quilter so I can continue to make tops. 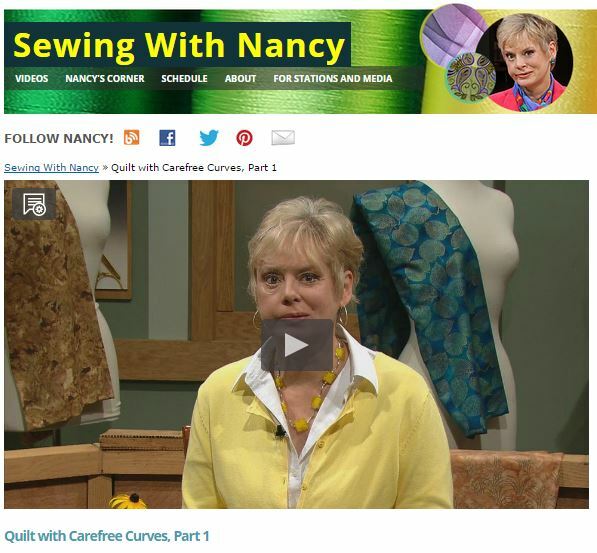 I appreciate Nancy’s tips and programs about all types of sewing; I have learned a lot from watching and re-watching. Now that the programs are available on the internet it is not necessary to record all those in your series. oh my gosh – never thought of using my tailors clapper. It has been 15 years since I did any dress making and haven’t used it since. I make baby mission quilts for the church and full sized for gifts. Sneak a few table runners in there when I need a quick gift for a friend. I love to create baby quilts. I was doing it for alot of my friends as they has children. Now I’m making a few for our Lil guy. I try n make them all unique and different! I’m going to try and do this BOM. However, I might be behind for now. Catching up on a few before baby n then after…I hopersonally to find a new routine-sew while he naps??!! I love to make larger quilts, I have made one for each of my nieces and nephews. Now my first grandchild is on the way. Baby quilts are my favorite to make, as they provide opportunity to use wild colors & patterns, and I can quilt them myself! Smaller sizes (table toppers to throws) enable one to try different patterns but I like to make 86″ to 90″ square bed quilts. My favorite size seems to be a is a super queen. Almost King size since I love a drape over the sides of the mattress when bodies are under the quilts. I like to make Queen or King’s because I can really explore the designs and expand on a theme. However, I also do art quilts, and it’s nice to challenge myself with a limited size in which to create. I like ‘em all! I generally make lap quilts or throw size quilts for the same reasons as already given — easier to quilt on the standard size sewing machine. I like queen size the best. Just found this blog and I am looking forward to the Block a Month! picking my fabric for strips is great fun! I could not figure out now to comment on the site, so I am doing a response to another’s comment. I would LOVE to make a queen size quilt but so far all I have done is ONE throw quilt – it just goes over the last two feet of the queen bed, like in some hotels. it looks pretty good but I got some puckering when joining so I defintely need instruction and practice. thanks in advance for that! I’m with Diane! I prefer making throw size quilts, because it’s too hard to quilt large ones on my DSM. I have made a queen, crib and twin so far. Any size will do. I am more interested in learning new techniques and different patterns. All my quilts have been easy ones, even though I drool over some of the harder ones. If this involves circles it will be my first attempt as all others r straight cuts. I definitely prefer lap size quilts for gift-giving. Mini quilts are best to try a fun (perhaps expensive) fabric collection, new block patterns and new techniques. I like laps and throws the best. I’m not confident enough to do the quilting on a big quilt. I like to make bed-sized quilts. I usually make a lap size quilts but I have a queen size bed and I keep trying to make a queen it it always ends up a lap. So one of these days I’ll actually make the right one. I love making twin size quilts for my kids and grandkids. My favorite size to make is lap size. I like useful sizes. To make a quilt with a purpose is fulfilling for me, whether it is a crib, twin, full, etc. My satisfaction with putting it together is fulfilling, but my joy comes from seeing the recipient thrilled to have the gift. I like an oversized lap quilt (husband is 6 ft 3 in and I’m 5 ft 9). Twin is a bit too big. I like kid size because they’re quick, but I actually like piecing more than anything. My favorite size quilt is lap size. That is about as large has I have been able to comfortably quilt myself on my machine. I have been doing upholstery work in our home business for a number of years. Now that I’m retired, it’s time to start on my dream of giving to a good cause by using my time and resources learning to quilt. I have seen some projects on your show that would be good in helping others. The strata quilt would be a good one to start on and the Carefree Curves Template would really be helpful. I’d like to start with a twin or lap quilt for this project. Thank you for this opportunity and boost to get me started. I like to make lap size the best but I need to make king/queen size. I get bored making the same block over and over for a king. I therefore enjoy learning new techniques. I make quilt tops that are 60×80 for my church quilting group who complete them and send them off to Lutheran World Relief. I love imagining them covering families all over the world. It inspires me to make them as beautiful as possible with the scraps I’m given. I love queen size. I have a sleigh bed that my hub by made us out of oak and if I make a king size it seems to cover the gorgeous wood. I enjoy making any size quilt! I enjoy making all size quilts. Seeing everything come together is an awesome feeling. I’m excited getting ready for this quilt-along. I look forward to seeing what your creativity will bless us with this year. My loved ones thank you in advance…smiling. God bless. I like to make any size quilt. I am making a machine embroidered one now. With two sons weddings coming up this year, I think queen size will be the challenge for this beginner quilter! BOM is great! One of the weddings is in December! I like to make queen size quilts and have made two using the Betty Cotton Theory, quilt as you go. It is so much easier than trying to sew the top and bottom together. I most enjoy making wall hangings, table runners, and wearables. Thank you for this opportunity. I like to make queen sized quilts. I have only made queen and crib sizes. My favorite size quilt to make is a lap or twin size since I am disabled and can’t seem to manage anything bigger, yet. But, with surgery, I might soon be able to change all that! Thanks and blessings to you, Nancy! I tend to make lap quilts because I can more easily quilt them myself. They make great gifts too. I like to make all sizes of quilts, from crib to king size! I like a variety, mostly 42×48 max. I quilt my own on my home sewing machine and that works best for me. I love the comment, “snuggle size”. My project quilts usually end up about 60×70 inches give or take. Although, I think baby quilts are the most fun to make; quick and easy, they offer almost immediate gratification. I have been sent since I was three years old sitting by my grandmothers knee and yet I have never made a quilt. We have a king bed and a queen in the guest room so those are the size I want to make. I am hoping to follow a!ong this year and use scraps. Wish me luck and the templates would be a huge help. Formal dresses don’t scare me yet sewing a quilt does so looking forward to the in-depth slow pace ought to be a big help. I prefer large lap or throw size; easier for me to quilt. I mostly make crib size or lap size. But want to make a larger quilt next time. Small quilts, tablerunners, and wall hangings. generally lap size or smaller as they are manageable on my home machine. I like to make crib and lap size as they are manageable on my machine and fun to give. Any size, but I like the instant gratification of a lap quilt or wall hanging, and lately, mug rugs. And purses and jackets. I am novice quilter. I completed 2 full size that I tied and 1 baby that I quilted with my sewing machine. I made a California King that went out to be machine quilted that needs the binding and a queen that is at the quilters. My favorite size is probably a king. I seem to start out with a king and then realize that I have become un-enchanted with it before I finish and then it becomes someone else’s quilt. Funny how that happens quite frequently. Oh well I do like to make someone’s bed look nice. Ha Ha! It has to be manageable, but I have never tried a king. Most of mine have been small, usually baby. I would like to try something different though. All my quilts seem to be queen or bigger! I am just trying to use up my stash!! I like the lap size quilt right now. It’s small enough to handle easily, yet large enough so I can get a true feeling of the overall design. I love the whole quilting process from auditioning fabrics and ideas for the pattern to completing the binding! By making smaller quilt projects I can make more, which makes me happier. I like creating the smaller sized quilts…. some go to babies, others are hung on the wall but the majority are used as lap quilts. I have been attempting circle blocks with so-so results. That makes me excited about your templates and book. Thanks. My favorite size is King.. for some reason I just love making them… I love having the quilt hang over the bed.. The smaller sizes are easier to get done! They tend to be used more often ! My favorite size to make is lap/throw size simply because at 67 with health issues, life is short & I have more projects in mind than time to do them. My favorite size to use personally is an over-sized full. My bed is an antique full size bed with a pillow top mattress so I like a larger than normal drop length to completely hide the mattress. Love your give away. It is a close tie between child or lap size quilts but I make a few more child size quilts. Lap size for me. I love having choices when it’s time to cuddle up under a quilt on a cold winters eve. I can choose a quilt to match my mood or my tv show! Thanks for a wonerful give away and a great block of the month. This is going to be as interesting as all get out! I like to make double bed-sized quilts and baby quilts. My favorite size is 70×70. The square shape gives good balance to color and value choices and is small enough to really show the design and workmanship. It is big enough to use as a throw, table covering or wall hanging and displays nicely for the way most shows and shops hang the quilts. I prefer the lap size so I can give my husband a new one to watch tv with often. Got to keep him guessing about the next one. I like to make big quilts & I have made a lot. Ocassionally will make a baby or lap size. Lap to Twin size are the easiest to handle. When they get bigger then that it gets harder. Nancy, I would use the middle size if doing a quilt. Even though it would be quicker to use the largest circle, I think the middle would be better at showing off the design. I don’t like trying to sew small designs. I am new at applique and sewing a small curve may prove difficult. So I am a middle of the road sort of sewer. I think your tool is nifty. I like the throw size-perfect for chairs, sofas, and beds. I like queen-King. Thanks for the opportunity to win these templates. My favorite is a full size quilt. It’s big enough to use on the bed but you can still use it for a throw on the couch. Yes, my grandchildren love to wrap up in their quilts! Looking forward to this year’s BOM. My family likes “lap” quilts that are long enough to cover from head to toe and wise enough to roll up in and relax while binge watching tv. I have made one quilt so far, and I would love this opportunity to create another. It was a lap size. I make baby quilts for family and queen sized for myself. I also send my tops out for quilting since I don’t want to chance ruining them. I’m burnt out on big quilts which never seem to get finished. I would rather go for lap size so I can get it done and on to the next one using all this stash I have….. I have made just about every size quilt. Large lap/snuggle quilts are my favorite. Everyone loves to have them while watching TV or reading a book! I enjoy making table runners, wall quilts, and twin size all the way to queen size bed quilts. If I can’t manage to quilt it by machine because of the bulk, I hand quilt it. And I have to admit I especially enjoy hand quilting on cold winter nights snuggled under the quilt I’m hand quilting while listening to an audio book. It’s my idea of heaven and I can’t wait until I’m done with chemotherapy and regain my strength so I can resume quilting. 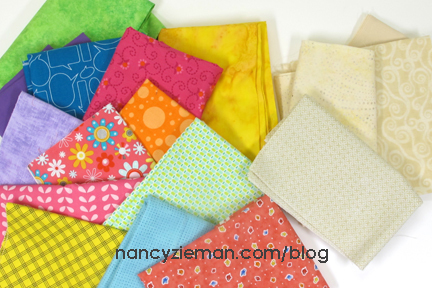 Lap quilts… everybody can use them & they are a good size to donate to Project Linus. I like the quilts that are crib size. The kids use them for sleeping and then also drag them in when cuddling in the family room. I’m fairly new to quilting so my favorite size is crib size. i haven’t gotten the never yet to go larger. Baby quilts bring joy to the parents, babies, and me! I like to start out making a queen size quilt. However sometimes they are closer to the full size. Maybe I need to measure three times before I start cutting. Lap sizes are my favorite. I don’t any baby size people to make quilts for and bigger quilts are difficult for me to manage with my shoulder issues. Thanks for the BOM. I really like your blog. I enjoy making small quilt projects including wall hangings, table toppers, table runners and lap quilts. Most of the quilts I’ve made are lap size. That size seems to be best for gift giving. I like EZ quilts for gifting and I love challenging quilts to learn and keep. I have two rooms full of fabric that is just waiting to be something. BTW I have learned so much from your lessons and books. I even remember when Mary Mulari first debut on your show! Thank you. I love to make quilts of all sizes, from wall hangings to Queen Size. However, my favorite quilts to make are Queen Size, as there is a lot of surface area to design and quilt.I feel with all this surface area, I can really play with value and color, as well as the quilting designs. Your tool looks interesting. I’m looking forward to seeing how you use it. I really enjoy making lap size quilts the most. Also like to make crib quilts. I like the look and process of quilting. I like queen size so I can use them on my bed through out the year. Currently I am working on baby & queen size quilts. I really appreciate all you have done for the sewing & quilting world. I learned to sew watching your programs! Never stop, Nancy! I love making throw-sized quilts. The ones you snuggle under while watching Nancy on TV with a nice cup of coffee on Saturday morning. I like to make twin sized quilts. I’ve made several for my pre-teen & teen grandchildren. One just went off the college so probably will be starting queen sized in order to have it done by wedding time. Creating baby quilts is the only way I can ensure a finished project! Plus it’s always a labor of love! Creating baby quilts is the only way I can ensure a finished project! Plus it’s always a labor of love! Thanks for all of your helpful tutorials throughout the years Nancy! I prefer Queen, bigger but they cover a bed and are functional rather than a decorative item. With other projects to finish up I like the smaller quilts. Easier to store while working on them and thinking of who to give them to. I make small quilted bags to king sized quilts… What ever I am working on is always my favorite. I prefer lab quilts. They are great on the go quilts. Large lap quilts, any larger they are too bulky to quilt on my machine. I like making lap quilts as I can donate them. They offer me chances to use fabrics that I would not use in baby quilts and there are so many great patterns/techniques to try. Queen Bed size. Good for my bed, hangs to the floor on a single, good for picnic rugs and snuggling on the lounge. Smaller quilts similar to lap size appeal to me. Gratification comes faster that way. I like lap size to twin size quilts. They are small enough to finish before a new project comes along. Right now my favorite size of quilt is the crib size…I’ll be a first time grandma in April! I like to make throw size quilts. I prefer to work on lap size quilts. I usually give my quilts away and these seem to be a size that works for anyone. My favorite size quilt to make is Queen size. To me, it’s just the right size to cuddle up in. My favorite size is throw size about 48″x 60″ easy to curl up under and big enough to put on the floor for kids and babies. I like table sized things; runners mug rugs, and place mats for myself and quick easy gifts. Any size quilt is my favorite as long as I am quilting. I enjoy full sized quilts, I think they are the perfect size. I like to make large lap quilts. However, I usually make queens because that’s what most people I quilt for want. Either way I’m happy, as long as I get to quilt Thanks for all you do Nancy and for another chance to win! Queen size using Betty Cotton’s Theory method where you quilt first and then assemble. When finished you have a completed quilt! Yay! I like lap size qilts and quilts for children. I’m more likely to finish them. I have completes some queen size though. At the present time, I have about 10 started. I like both lap and full sized quilts. Thank you! I love making lap size quilts. They are the perfect size for a child who needs comforted in stressful situations. Also, they are quickly completed and easily personalized for the specific child when a request comes in. Lap quilts and/or baby quilts…. I’m handicapped and can no longer ‘crawl’ on the floor for the positioning and pin basting of large quilts anymore. And my strength is really lacking in my older age, so I can’t give what it takes to quilt large quilts on my sewing machine anymore either. But I still love quilting so you would find me making a lap quilt and/or a baby quilt. I also make ‘smaller’ quilts (like: block or two sized) to put on my various tables! I enjoy making lap quilts. They are smaller and easier to manipulate during the quilting process and I can personalize them to give as gifts. I also think that the people I gift will be more likely to benefit from a lap quilt than a bed quilt as bed quilts do not always fit their home decor. I’ve tried circle piecing after a class run by my quilt guild but haven’t had the courage to use them in an actual quilt yet. I like to make lap-size or crib-size quilts. I sew a lot for children’s charities. Also I machine quilt and the smaller sizes are easier for me to handle. Glad to see there is another BOM for 2016. I love to make baby quilts & lap quilts. They’re just so much easier to handle & quicker. I like making toddler size quilts, just wide and long enough so I can bring up the back side to make the binding, All go to the local domestic assault shelter for little ones to have something of their own. I like to make quilts from baby to king size. I just enjoy the whole process. I like all sizes of quilts. Don’t seem to be able to make anything except baby quilts. To many family members in the baby mode. I make Twin size quilts and donate them for benefits of People who are fighting Cancer. I am asked for more baby blankets however. But my favorite blanket to make is a Queen size. I like making lap quilts because they are versatile — to warm us when we’re sitting reading or watching TV or even sewing, or to put over the foot of the bed to protect cold feet, or even to pretty up a large bare space on the wall. I can “handle” a lap quilt as well, where a larger quilt is a challenge for my sewing abilities at this point. I have made a queen embroidered quilt, but mostly for time & space I make lap/baby size & table runners. I like my quilts 100″ by 100″. I like them square, so they rotate easily. I also like them to cover my think mattress. I love to make nap-size quilts for kids and adults. Gives me more opportunities to try different quilt patterns. The more quilts I make, the better my free motion quilting becomes! Learning this curve sewing technique will help me too with my bag making and sewing in general! Thanks Nancy for another great opportunity! I LIKE LAP QUILTS. THEY DON’T TAKE VERY LONG AND ARE PERFECT TO KEEP ONE WARM AND COZY. I ALSO MAKE FLANNEL PREEMIE QUILTS FOR THE LOCAL HOSPITAL AD THEY ARE ALWAYS APPRECIATED. I CAN’T WAIT TO GET STARTED ON THIS 2016 QUILT. Have made a lot of wall hangings, but have now started to make twin size quilts. I love to make queen size quilts. I cant wait as this will help use up my stash. My favorite size is snuggle size. This depends on the recipient of course. So looking forward to this! Loved the first episode and started sorting fabrics since… We have a new women & children’s home, that is a long term facility that prepares these women to live a chaste and meaningful life with the spiritual and career skills to care for the family on their own. This would be perfect for me to do for the individual rooms. Blessings in the New Year Nancy!!!!! I’m posting again because it doesn’t look like my first comment posted. I like any size from table runner to queen. I like to make lap quilts up to twin length for those tall people in our family. And baby quilts are always the most fun!! most quilts that I make are full size or larger. I love making twin size quilts. But friends and family always want a queen size. So, I guess I like making both. So far I have only made table runners, my next project will be a twin size quilt. I am a beginner quilter , so wish me luck !! This will be a first quilt for me so I will have to wait to see what size it is. I am getting very excited to try this. I don’ make too many large quilts that have to have professional quilting. Little larger than lap size; no larger than twin is about all I can handle. This looks like fun. Love to make and give queen-size quilts! I like to make lap size quilt because I can use with my family and also I can give it as presents to my friends. I am looking forward to following this quilt along! My favorite size quilt is a baby quilt, although I have made them up to the queen size. In fact my next quilt will be a queen size quilt. Love, love, love the bright colors!!! Another project to add to my bucket list, this one looks like a real stash buster. I haven’t done much with circles and curves. Looking forward to the new year and a chance to win the template set. Happy New Year!! I make quilts of all sizes but the majority tend to be lap size. my husband & I enjoyed twin quilts…one for each of us on a king or queen size bed….no cold shoulders. Currently, my favorite size quilt is a lap size. I guess I go through phases from wall hangings, table runners and placemats to queen and king size quilts. I love them all!!!! Love queen or king. But recently have been making lap sized for our very cool house! I really like wall hangings to decorate with as well as table toppers. I make these the most. When making lap quilts, they have to be long as those I make them for are tall, so I usually make long twin size. I am currently working on a king size for our bed. Having made all sizes, I’m now working on full size which I think is more versatile. It can be a topper for a queen size bed, fits fullsize and be slightly oversze for a twin bed. I like to make lap quilts, can never have too many! I spent much of last year healing from a major operation and recurrent infections which required rehospitalisation so I did not participate in the block of the month quilt because I was unable to get to or sit at my sewing machine for long periods. This will be my very first quilt so I honestly do not know what size I prefer. But just having read your starting tips have me enthusiastic and ready and to start so this year, I will be making a block each month. I’d love to win the Carefree Curves Template set but will be buying a set if I don’t because I want to be able to start and finish this project. I am currently working on throw size quilts but usually I make queen size. Thanks for all you do. I like to try lots of techniques so table toppers and small wall art quilts are my preferred size. I can only use so many bed sized quilts! I like to make lap sized quilts and baby quilts. I’m trying to quilt them all myself by teaching myself how to free-motion quilt. There are such wonderful tutorials out there. Lap size quilts are my favorite. I can them before I get bored with them! I like to make all size quilts, wall hangings, table runners etc. I guess I just like to sew. This year block of the month sounds like fun, looking forward to 2016. I read your book, Seams Unlikely in December, what a delight. Sending prayers for a healthy 2016. Right now I’m making a lot of throw size quilts for gifts and charity, but my favorite size is king, when I have the stash to do it. My favorite is between a twin and a queen. I end up with what ever size the pattern decides it wants to be or just make wider or narrower borders. My favorite size quilt to make is a medium size wall quilt/baby quilts. Big enough to explore different things but not take too long. My favorite size quilt to make is a baby or lap quilt. 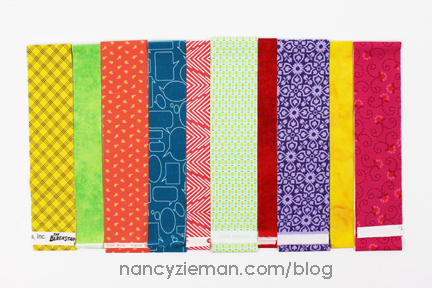 They are fun to put together and are especially fun to quilt on a regular sewing machine! Thank You for the opportunity to win this amazing prize. The Block Of The Month is going to be a spectacular adventure! Have a wonderful creative day! I like to make mini quilts. Our grandchildren particularly enjoy changing decorations for seasons and holidays. Table runners, wall quilts, and other smaller quilts gives each of them an opportunity to participate in decorating the house. Thanks for sharing your many creative ideas! I enjoy making queen-sized quilts, since they seem to be the size of bed that most folks have. I figure that if I’m making a quilt at all, I may as well go big! Thanks, Nancy, for your numerous helpful ideas! My favorite size quilt to make is a lap quilt. They are so versatile—quick to make (almost instant gratification), good for adults and children, work for guys or gals, and make great gifts and charity quilts. Thanks for the opportunity to win. I love to make picnic size blankets for our family to keep in the back of the van for those impromptu picnics or stops, or long trips! I enjoy making twin size quilts, or larger. I find that larger size quilts can have more intricate designs while using larger size shapes. And, because of the larger size, I can get more involved in the ‘masterpiece’, something I enjoy so much! I love making all sizes but it’s much easier to quilt baby and lap sizes for me. Thank you having a give away! My favorite sized quilt to make is a lap or full because of having to cut all of the pieces by hand. Saving up for a fabric cutter for the future. I’ve made all size quilts before, but now I tend to make “throw size” quilts because they aren’t too big to quilt myself, and seem to get more use from them. I prefer to make baby quilts or lap quilts. My favorite size of quilt to make is small and fast – lol. Working two jobs gives me little time for use of my creativity – so I like projects that allow me to accomplish something quickly so i can do more. Baby and lap quilts of all sizes. I give most of my quilts away so queen and king sizes are not affordable for me to give away. I like to make queen size quilts it seems. I also like smaller table runners and mug rugs too. This BOM sounds really interesting with the strata and curves. Thanks for bringing it to us. Wishing you best health this new year. I like larger, throw-sized quilts, about 60″ x 72″, so good for naps on the couch. I love also making baby quilts, about 40″ x 40″. I like a challenge. As my five grandchildren have graduated from high school, I’ve made a king-size quilt. Three down and one ready to quilt. Like the others, I prefer lap quilts. They are so much easier to handle on my home sewing machine. This quilt of the month is very intriguing as I have never done circles. I am ready for this new experience. Thank you, Nancy, for the impact you have made through PBS. My favorite to make is what I call TV watching size. First, I would like to thank you for last year’s BOM. I loved the colors, so that is what I also used. My favorite size quilt is whatever one I’m working on at the time, but I do seem to pick out more lap quilt sizes than any others. I’ve only made a twin size but really want to get into making one for my king size bed, just anxious about my tools and ability .. Lol I would like to get into baby quilts, table runners and placemats too! I am in the middle of making queen and king for my 5 grandchildren, but lately I have been making baby quilts, as we have 7 soon to be mommies in our church. Favorite size well if binding by hand, the smaller the better. I don’t like square quilts EVER. My favorite size quilt is a lap size. Not too big to run out of steam while making it and large enough to use as a quilt or to display as a wall hanging. Thanks for the chance to win. I love to make lap size quilts: 55×78. I can handle them easily and quilt them myself. I love your show and hope to win this quilting set. Looks like a lot of fun. I like to make lap size, wall hangings or table runners. I am still trying to learn free motion quilting on my domestic machine and anything larger is quite intimidating to me. This looks like a really fun block of the month quilt. My favorite size quilt to make is baby,and lap. There quick and easy,fun to give as gifts. You can use up a lot of your scraps that way. And experiment with new quilt patterns. I prefer to make smaller quilts or wall hangings, and especially clothing. That way, I can do more different types of projects, without the time required for larger quilts. So far lap quilt is the largest I’ve made. I have 2 queen size tops ready to quilt. I just enjoy quilting . Would live to win. Planning on making the 2016 quilt. I like making either crib size quilts or comfort size quilts. They seem to get more use from the recipient, use less fabric and give enough space for creativity. I like to make lap to twin size quilts, as they’re easier to handle when quilting on my regular sewing machine. When I’ve made queen or king size quilts, I’ve preferred to send them out for long-arm quilting. I like to make smaller sized quilts – lap, throw, & children sized quilts as they go together quicker and see the results much sooner! Love this BOM project. I love to make throw size and smaller quilts. I can quilt these myself on my machine. I also make a lot table toppers and runner – I change out what is on my dining room table monthly! I have been making 40 x 60 (approximately) for charity quilts, but I finished several queen size for family last year, so I like both. This block challenge should be fun! As far as I am concerned, it doesn’t matter if it is a mug rug or a Queen size quilt, it is the process of quilting that I enjoy. And the pleasure of giving it away! Love the idea of strata mixed with curves. I really need the trace and create curved set! I like doing lap size or slighly large the best, easier to handle! I like to make queen size quilts but also like to make the smaller quilts for Ronald MacDonald House and other charities. Thank you for the give away and for the Block of the Month!!!! I’d like to make lap quilts for nursing home residents that have no family to help them. Also with my own health issues smaller quilts help me feel I’m accomplishing more and easier for me to handle. Lapsize quilts are easier for me to fit under my domestic machine for free motion quilting, so they are my favorite. My favorites are lap quilts. They are so versatile. They can be given as gifts, used on car rides, picnics, wraps, pillows, extra bedding at home or on trips, and to protect furniture and delicate items while traveling. Lately, I am into making placemats. They’re quick and fun projects for trying out patterns and colors. They can add a festive touch to the table, be used as table toppers in other rooms, as counter savers, or given as gifts. I enjoy making smaller quilts–lap size, baby size, tablerunners, and wall hangings. I like to make lap size quilts. They are the perfect size for learning machine quilting. Plus, I get to see the finished quilt top quicker! Thanks for this adventure! This will be a great chance to use up small pieces of stash that I just couldn’t bare to throw away. I usually make full and queen quilts but if I really love the pattern the size doesn’t matter. Queen sized quilts seem the best size for my uses. I like to make queen size! I need a peek of the finished quilt. Thanks so much for the block of the month program. Large lap quilts for me…but my favorite are baby quilts. The largest I’ve ever made was a twin size but my favorite is crib/child size. They are not so big and bulky to quilt and also easier to try fun designs on the back. Can’t wait to start the 2016 Block of the Month! Lap and baby quilts. Once I start a project I feel like it already belongs to them. So there are a lot of good thoughts and prayers that are sewn into each quilt. I am new to quilting, so all I have made so far is a lap quilt. I am looking forward to quilting along with you in this quilt block of the month project. Last year I watched your BOM progress but did not participate. And after seeing the finished quilt of black and white with lime green I wish I had. I’m not going to make that mistake again. I’m all in. King size is the way to go. I want usable quilts. Time to go through my stash! Well my answer is I don’t know yet! I want to try making a quilt, but I have never sewn one yet. Baby quilt ~ and whisper a few prayers for the Little One as I’m creating. I’m new to piecing quilts, and have done throws and fully. So far fully are my favorite. They allow for more design and larger borders to increase to queen if necessary. I make all sizes of quilts. I enjoy throw and crib size quilts because they can be finished quicker than larger sizes. I usually end up making large to extra-large lap quilts for people to wrap up. But also make bed-sized quilts. All depends on the occasion and the person I’m making them for. warm on those really cold days. I make all sizes. I enjoy making throw and crib size quilts. They can be finished quicker than a larger quilt! I’ve made numerous king-sized quilts and I’m suffering burnout. I absolutely love making table runners mainly because I want to learn and master the technique. I love making queen size quilts. I love to change by quilts on the beds. I always start out small with one block with the intention to make a throw but see more that can be added and end up with a queen sized bed quilt. lol. Maybe because I have a queen sized bed. I like to make throw or twin size quilts best. Any thing larger is too unwieldy for me. Thanks for the new block of the month – looks like fun! I like table runners and baby quilts, but I need twin size for the grandchildren bedroom. Looking forward to this project. I make lap quilts and art quilts. Our charity group makes lots of baby quilts. Thanks for all you do, Nancy. Great instructions to get started on this project. I like to make twin size to be used as “personal” quilts for snuggling by my “grands”. Hope to be in on this for all of 2016. Right now Ithrow size quilts are my favorite to make. I usually make throw quilts. They are easier to quilt on my machine. My favorite sizes to make are lap and baby quilts. Lap quilts or oversized square quilts are my favorites. I like the symmetry created in square quilts. I really like to make queen size quilts. Thanks for the great giveaway. The quilt along sounds fun. I certainly have plenty of scraps! My favorite size quilt right now is throw size or even a twin as I can quilt it myself on my little Bernina. I like to make table runners and lap size quilts. Smaller quilt projects give me a chance to try more patterns and techniques. I like to make lap quilts as I can quilt them with my domestic sewing machine. I’m in the process of making one for each of our grandchildren. I like making queen size quilts. However, I have a new grandson and 2 recently adopted grandchildren. They all wil be getting a twin size quilt. I am new to quilting and for now I enjoy making baby quilts. One day when i have more experience I will try a queen size. I have made all sizes. I like queen to king size because the piecing is my favorite part of the process. My favorite to make and give is queen size as it is used for beds. I like making lap size quilts. They are quick and everyone can use them regardless of their bed size. I like to make table runners, sometimes turned into lap quilts! I do all sizes of quilts from table toppers to queen. But my preferred size is smaller like a twin, it fits under my machine easier to do machine quilting. Thanks for the giveaway! My favorite size to make is a lap quilt or slightly larger–that way I can use them to “snuggle” with sitting in my recliner and they are “out” for all to see instead of being on my bed “made up”. My favorite size quilt to make is approximately 60 x 72″. It’s a good size for snuggling under while watching TV or for some added warmth in bed on cold nights. It is also a good size for quilting on a domestic sewing machine. Anything bigger get s a bit trickier to quilt on a regular sewing machine. I don’t have a favorite size quilt. I enjoy the process and decide on the size when I’m choosing fabric. I have not made a quilt in years. I think I will join you this year in making this one. It sounds like a great project to start a new year. I love my handmade quilts. I am looking forward to joining you. Mine all end up being a little larger than a lap quilt. I have been known to make larger ones though. I don’t like having to prepare a large quilt for quilting, but I do it when I have to. Full size is my favorite but I enjoy lap /child size for quick projects. My favorite size to make is a large adult sized nap quilt, about 60X72 inches. However, I love making any sized quilt, just to make the quilt! I like at least 72 by 84. It is the perfect size for taking a nap on the sofa. I like queen size quilts. What size will the finished quilt be? I haven’t done a quilt block project like this before. Will we be able to post questions and photos of our work along the way? Thank you for a fun adventure! I like to make baby quilts because I can quilt them on my home machine. Anything bigger than that gets too bulky for me ! I also like lap quilts, although they sometimes grow into a between lap & twin depending how much fabric I have. Hope your doing well Nancy! I enjoy making twin size the best. I like to make wall quilts and table runners. I love to make lap quilts. Smaller and faster to complete, which gives me a sense of achievement. And add that to my work hours, I can can get “one and done” and then move on to the next one! LOL So many fabrics and designs it boggles the mind! I prefer to make lap size to double bed size quilts. Looking forward to following the quilt along.